You might have thought that this blog is dead because I seemed to have abandoned it. The truth is, after I wrote my last post, I realised that was the 99th post, which makes this the 100th post! I was cracking my head how to make it a little more special, it took me quite a while to reach 100 posts, and there will be more to come! Then I remember there is an important day in March. 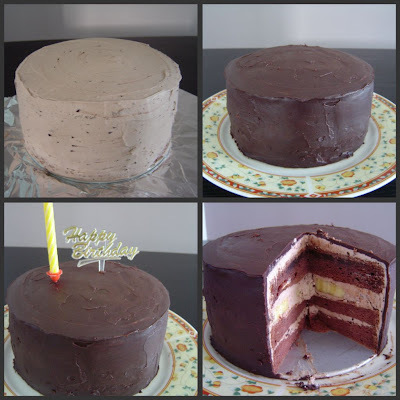 So, I decided to coincide my 100th post with my post on the cake I made for dear's birthday. 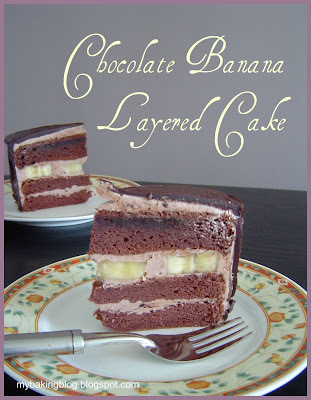 I decided to make Chocolate Banana Layered Cake. We like the one from the eatery Secret Recipe, so I tried to imitate it, though mine still looks quite far from it. As you can see, the layers are not equal, and the bananas were beginning to look like they were too heavy for the sponge. Congragulations on your century post a wonderful achievement and a delicious cake too for celebrating. Congratultions Bimmer. Wow what an impressive looking cake! I've been looking for a recipe for this for ages. would you mind sharing the recipe/source as well? Many thanks! Happy Cook and Marie - thanks ladies! Ann - I was around all the while, just lazing! Have left a slice for you! glad you are keen to try the cake. I have added the recipe for the sponge cake and icing in my recipe blog. You can also find the Swiss Meringue Recipe already there. But you I made these changes for the SMBC: reduced sugar by 1 TBSP, and added 20g of melted chocolate (you can add more if you want). To assemble the cake, spread SMBC and lay out thinly sliced bananas. I only put bananas on one layer as I was afraid it would be too heavy for the sponge and will collapse it. I also spread the whole cake with SMBC, chill it for a while, before spreading with the chocolate truffle icing, and then chill it again. 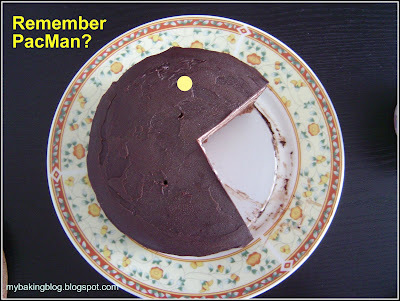 hahahha... yeah its like pacman i simply love that game..
so want to taste it right now.. This is a wonderful cake. It would make anyone happy.